Building on the basic education provided at the undergraduate level in their field of specialization, the master’s program gives students an advanced specialized education that aims to impart broadly related knowledge that not only focuses on their field of specialization, but which spans the spectrum from basic to applied knowledge. This approach produces graduates who are equipped with the foundations for growing into creative, international-level researchers and advanced, specialized professionals who will be able to play a leading role in today’s international knowledge-oriented society. Building on the full spectrum of basic and applied knowledge and academic skills cultivated up through their master’s program, the doctoral program helps students develop a keen insight into their field of specialization, an understanding of related fields and the ability to use that understanding, and the ability to continuously brainstorm solutions to problems. This builds knowledge that allows students to adapt to new academic currents and new trends in society and industry and produces researchers and engineers capable of launching new fields of discipline and creating new technologies and industries. Since April 2006, the Saitama University Faculties of Science and Engineering and the Graduate School of Science and Engineering have been separated into an Education Unit and a Research Unit. This means that professors who previously were affiliated with one of the faculties became affiliated as of April 2006 with the Research Unit of the Graduate School of Science and Engineering. Professors are sent from the Research Unit to the Education Unit and the two faculties and are then put in charge of the master’s, doctoral, and undergraduate programs. Graduate students belong to the Education Unit of the Graduate School of Science and Engineering. In structuring the Education Unit, the graduate school began by replacing the programs of the master’s program with ones that integrates science and engineering. Because of the desire to provide the standard student with a consistent 6-year education throughout their undergraduate and master’s programs, the graduate school established departments within each program, giving consideration to the importance of offering continuity between the education provided at both the undergraduate and graduate levels. 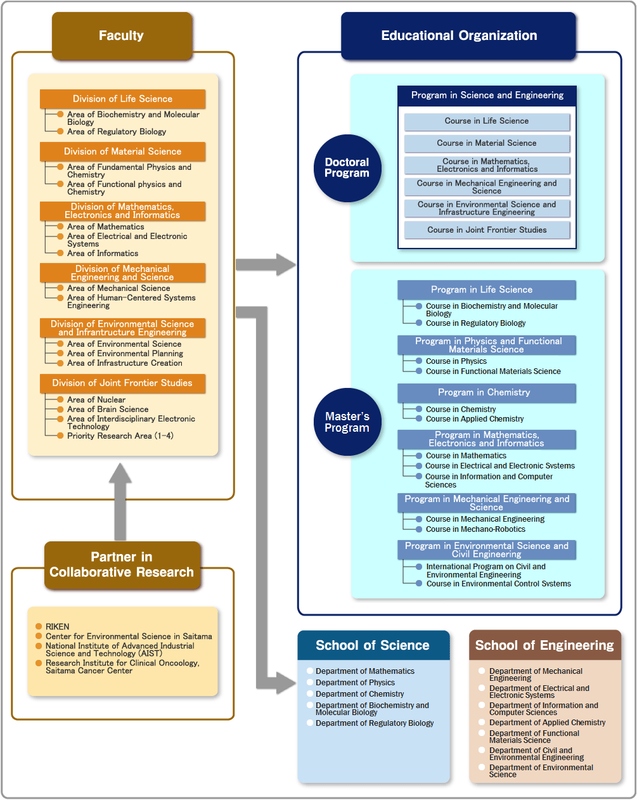 Further, the doctoral programs were integrated into the Program in Science and Engineering, which was then divided into six courses, thus achieving a balance between specialization and interdisciplinary collaboration/integration between science and engineering.